A trio of stocks starts 2017 by making their shareholders incrementally richer. It's entirely too soon to tell whether 2017 will be a good year for stocks overall, but so far, it's been kind to income investors. A bunch of companies have already raised their dividends, and hopefully, this will prove to be the rule rather than the exception moving forward. Here's the skinny on a trio of January lifters. If all goes well -- and at this stage there's little reason to think it won't -- energy industry powerhouses Spectra Energy (NYSE:SE) and Enbridge (NYSE:ENB) will merge into a single company in the very near future. Both are marking the end of their time as separate entities by hiking their quarterly payouts. Enbridge has declared that its upcoming dividend will be just over $0.58 Canadian dollars ($0.44 U.S.), a 9% improvement over its predecessor. Spectra Energy is matching that $0.44 per share by lifting its own distribution by 9%. Investors in both companies like the idea of a merger. The share prices of the two are up since it was announced last September that Enbridge would absorb Spectra Energy in a transaction valued at roughly $28 billion. There's good reason for that optimism, as Enbridge's crude-oil transport and storage business compliments Spectra Energy's sprawling natural-gas operations. Besides, the merger will combine two well-managed (and generally profitable) players in their respective segments into what will be one of the biggest energy infrastructure companies on the planet. Enbridge and Spectra Energy have effectively grown their respective dividends over the years, but can this continue? Recently, they wrote that their combined operations are "expected to support a highly visible dividend growth rate of 10-12 percent through 2024." That ambition is admirable, but $28 billion is a big chunk of change for an asset, and acquirer Enbridge has been strongly free-cash-flow negative for some time now. 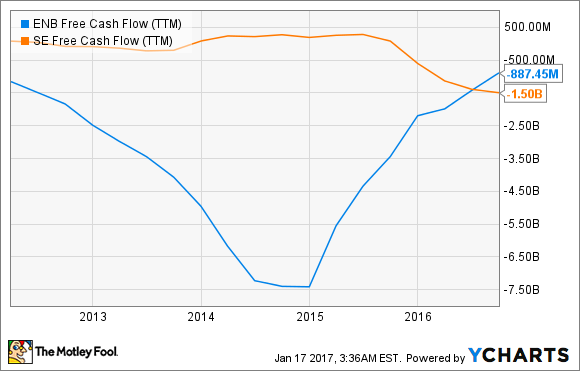 ENB Free Cash Flow (TTM) data by YCharts. The dividend has historically been a draw for both stocks, so shareholder payouts will likely remain a priority after the merger closes. Those deep-red numbers in the free-cash-flow line would concern me if I were an investor, though. Both companies are to pay their spruced-up dividends on March 1 to stockholders of record as of Feb. 15. Spectra Energy's would yield 4.2% on the company's current stock price, while the figure for Enbridge is a touch lower, at 4.1%. Both are more than double the current 2% average of dividend-paying stocks on the S&P 500. The merger has been approved by the shareholders of both companies. It's expected to close by the end of March. 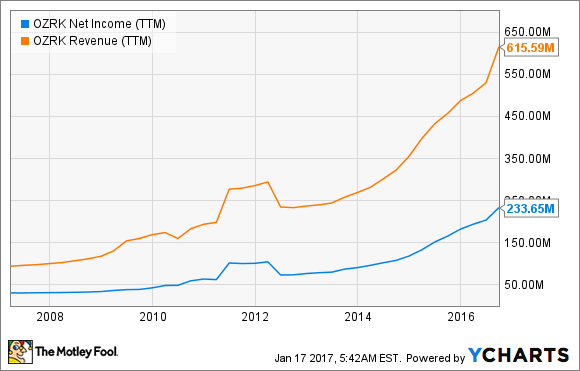 Bank of the Ozarks (NASDAQ:OZK) is a stock frequently featured in this article series, as it has raised its dividend every quarter since nearly the start of this decade. True to form, it recently bumped its payout 3% higher, to $0.17 per share. The company is a standout in its industry, a regional banking group that has some of the best credit discipline in the business. The bank's well-performing loans have juiced revenue, while a lean operation -- it has an enviably low efficiency ratio of 34% -- keeps profits high. OZRK Net Income (TTM) data by YCharts. Bank of the Ozarks' Q4 of fiscal 2016 was typically impressive. The company's revenue grew by a muscular 65% on a year-over-year basis, to $225 million on assets that nearly doubled, to almost $19 billion, while net income was 71% higher, at $88 million ($0.72 per share). The latter figure beat the average analyst estimate of $0.69. The net charge-off ratio from that quality loan book was a microscopic 0.09%. That growth isn't entirely organic -- Bank of the Ozarks has been assertively buying up compatible assets in the banking sector lately. Its deals for C1 Financial and Community & Southern Holdings closed last summer, and both of those new possessions are now included in results. This company is a strong performer -- I would confidently say that it's one of the top regionals in the country. Its acquisition strategy is smart, and there are few peers that manage credit risk so successfully. The bank looks certain to continue its winning ways, so I wouldn't worry at all about the viability of this new dividend. Bank of the Ozarks' new distribution will be handed out on Jan. 27 to shareholders of record as of Jan. 20. At the most recent closing stock price, it would yield 1.3%.